Add your name and email below to download the free Simmer recipe plugin for your WordPress site or blog. Your plugin download is sent automatically to your inbox. Be sure to double check your spam folder for your .zip file if it doesn't arrive or re-submit your email if you provide the wrong one. Thanks! Add your first recipe, share your creation, and test your results with Simmer directly on your site or blog. Recipes are perfect for any food, beverage, or do-it-yourself creation that offers value to your target customer. 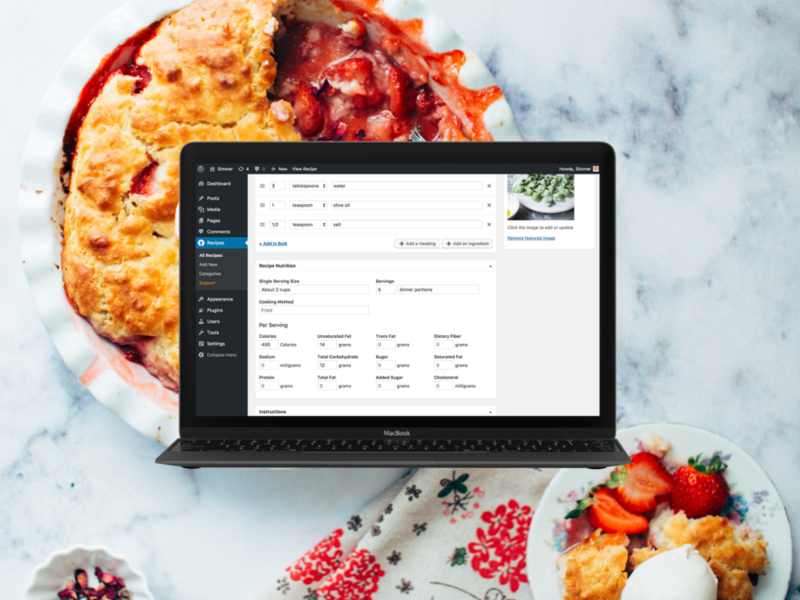 When you’re ready to add more than one or two ingredients, upgrade to Simmer Pro with optional extensions for advanced customization. Find answers at help.simmerwp.com or get immediate assistance from Simmer support. We're just getting started with adding our next batch of new features to Simmer Recipes. If you have a suggestion for a new feature, tell us! We'll include it in the core Simmer Pro plugin or an extension other sites can optionally add as an extension. With this plugin recipes can be printed in multiple and customizable formats. This toolbox includes a print action by default, making offline reference to your content easy. You can also add recipe ratings or recipe saving to enhance the power of this toolbox. Does this plugin integrate with all WordPress themes? Yes. Simply activate the plugin and test it with your preferred theme. If you find any part where you'd like to add customizations, developers can use the helpful classes built-into each part of recipe front-ends for complete control. My question isn't answered here. Where can find other answers? We have a collection of articles with questions and answers. If your question isn't answered there, feel free to contact support anytime or send us a message through the chat bubble at the bottom right.